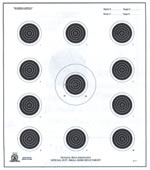 The official target used in competitions sanctioned by the International Defensive Pistol Association. 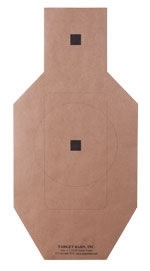 Based on our high sales volume of this target, it is our least expensive full size cardboard silhouette target, and is an excellent training tool for any shooter looking to sharpen his skills at the range. 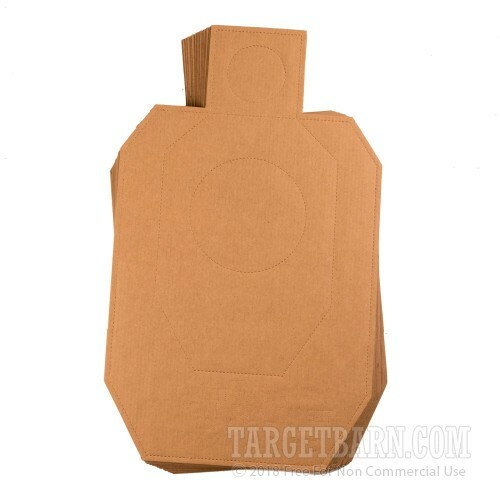 The Standard IDPA Silhouette Target is a man size silhouette, approximately 18 inches wide by 30 inches high, and die-cut from 1/8" corrugated board. The perforated scoring lines designate the "Down Zero", "Down One" and "Down Three" IDPA scoring designations. The targets are kraft brown front and back. 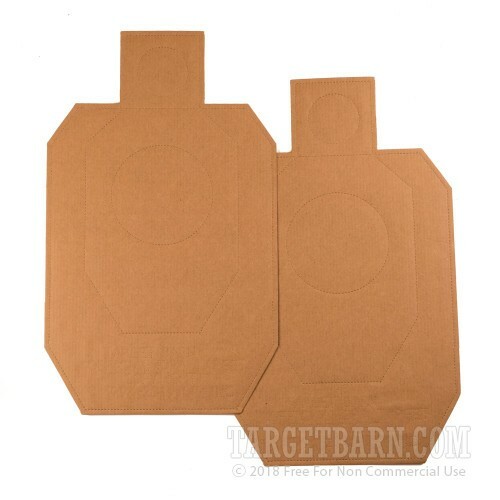 This is the primary cardboard target used in all IDPA sanctioned shooting events, and Target Barn has been proud to produce the highest quality IDPA targets available for more than a decade. Don't forget to order a few boxes of Tan Pasters to cover the bullet holes in these targets. 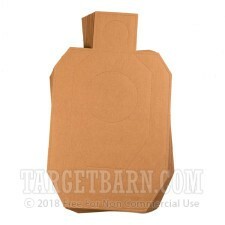 Target Barn also sells three lower cost paper targets and repair centers for lower cost training and practice between matches. They are IDPA-P, C-O-M Trainer, and WTS-IDPA-P. 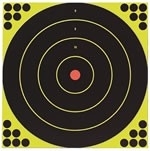 This target is often confused with the IPSC standard competition target, available here IPSC. IDPA has released this new design for 2017, which adds a 4 inch scoring circle to the target's head region, making the remainder of the head a "-1" scoring zone. Quality that was at the best possible price and delivered ahead of schedule! Pleasure doing business with you and look forward to doing more business with you in the future! Bullets go right through them!!! ...and the bullets leave holes so you can see where you hit!!! What more could you ask for from a paper target? Oh, yes, they're spot on for IDPA, price is great, and delivery is fast. These are great targets and are the best price I have found. Ordered another box of IDPA targets to practice with. Good price and arrived in a few days. Very happy with my targets. I will order more when they are needed. Great targets affordable and delivery was quick! We use them at IDPA and I use the with family and friends to give them a taste of fun shooting. Great targets, on-time delivery, good value. TargetBarn is now my top pick for target supplies. The product was pretty much what I expected. A good product at a very fair price. What I didn't expect was the shipping. I had a class coming up and was afraid we had waited until to late to go shopping for targets. I usually buy them local to help the local businesses. They help me so only fair. Everybody was out of these and I was in trouble. I found this site and called in an order. The lady that took my order was VERY helpful and nice to deal with. She said that due to the date I ordered and the days of my classes she was a little concerned that they might not make it but she would get the order out ASAP. As an emergency stop-gap I had a family member pick up some fugly backer boards from out of town just in case. I should have left the overpriced fugly backers alone. Your targets came in 2 days before my classes!!! Great service. I have passed your name on to the local shops I buy from so they can get in on the great service. Thanks! Nice to be able to shoot what you shoot in competition and 100 will last me a while. I was in a pinch and needed targets fast. I called prior to placing my order to make sure they'd arrive in time for a training evolution. I placed my order and the product arrived 2 day later. Thank you for the quality product, quick delivery, and great value. Excellent targets and great customer service!! I was surprised when targets were delivered, was expecting 2 or 3 more days. Good show. The targets are great they came quickly, but the shipping costs really puts a dent in the satisfaction. I don't know what the answer to the shipping costs is, but my shipping costs were 30% of the target price. They arrived on time as promised. Targets arrived quickly, undamaged, and were as expected. We use them for IDPA practice. Targets are great and the service you receive are fantastic. I continue to purchase from target barn because of their service. Targets are fine, service is excellent! These are standard IDPA targets and work as expected. Value is pretty standard as well. What is outstanding is the service from Target Barn. They always call to verify the purchase and getting the product shipped is the fastest I have seen. My club always uses Target Barn because of the very nice people and reliable service. They do what they are supposed to do. Normal IDPA targets. Same old IDPA targets I'm used to using. Decent price, even with shipping. It is nice to shoot some virgin targets that aren't taped up hand me downs from the club. Made me feel special! I shoot in IDPA and practice using IDPA targets and pasters. Shooting 9mm bullets allows me to use the same target for 2 practice sessions. The targets and pasters become very cost effective by being able to utilize them in this way. THEY WORK VERY WELL. PASTERS STAY WERE YOU PUT THEM. No longer shoot IDPS but did for years and these targets are as well made as any we ever used in a match. Not sure I've ever run into any 'bad' targets, but a box of these is just what the doctor ordered for my shooting disorder. Too bad shipping is so expensive, but will have to blame UPS for that. Target Barn cleverly kept it to a minimum by inserting my order for 20 boxes of stickers into the box of targets. These targets worked great and my nephews thought they were the best targets we've ever used for shooting. 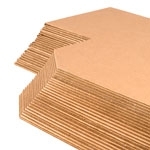 The shipping was fast and the product arrived without any damages. I'd highly recommend buying. Products are as they should be and turnaround on order is fast. Great company to do business with. Good service, fast delivery. Good quality. Using one of these targets and the pasters is the most economical way to get an afternoon of practice in. Very satisfied and I recommend them to anyone. I was very happy with my order. The only thing that I found wrong was the shipping box was damaged but the targets were fine. So it wasn't a big deal for me. Great targets. Wish they were a little cheaper to ship. I will be ordering more. Quyality is good. Holds pasters well...except when wet. Ever shot an IDPA match in the rain and wrestled with trying to score targets covered with clear plastic bags? Well ...yes. It's a pain, but shooting a match in the rain is better than any day not shooting. How about an IDPA target that is coated/semi-waterproof? More expensive. Sure, but how often would you use it? Good to have on hand. Would let your participants know that you prepare and that you appreciate them showing up in puddle duck weather. Pasters? Well...here's an after market opportunity...a paster that will stick to a slick/coated target. Q: IDPA - 100 Target Barn Cardboard Targets Is this target white on on side and brown on the other? A: This target is Kraft brown on both sides.